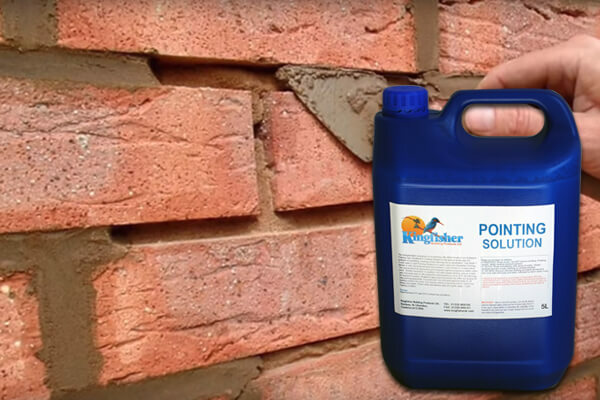 The indispensable companion in re-pointing with either trowel or our Quikpoint Pointing Gun, Kingfisher's Pointing Solution is the answer to the age-old problem of crumbling, cracking mortar allowing damp penetration. Just dilute 1:5 with water (1 part Pointing Solution to 5 parts water) with Kingfisher Pointing Mortar or with conventional sand and cement (1 part cement to 4 parts sand). The unique blend of copolymers and fungicidal agents produces a totally waterproof, flexible compound. In addition, this latex based additive acts as a lubricant, reducing wear on the Quikpoint working parts by up to 50%. By following the Quikpoint system, Kingfisher approved contractors can offer our unique 30 year pointing guarantee. For brickwork You will need approximately 5L of pointing solution for every 12.5 square metres of pointing mortar, assuming 20mm joint depth, 10mm width and dilution ratio of 5 parts water : 1 part Pointing Solution. Water is vital to the production of concrete but prior to the placement and curing, that can change. Because concrete is a porous material that can often crack, it is exposed to water penetration. This means that damage and deterioration can occur. Our waterproof pointing mortar can help protect structures from degrading. There are many advantages to utilising our high-quality waterproofing admixture. Due to durability being increased, it can help reduce costly maintenance costs. It can also be used for different parts of a structure. If you are unsure about how our waterproof pointing mortar can help your project, contact us for expert advice. Adding this solution to the mortar made the pointed wall wather resistant in minutes - definately a requirement with our climate.